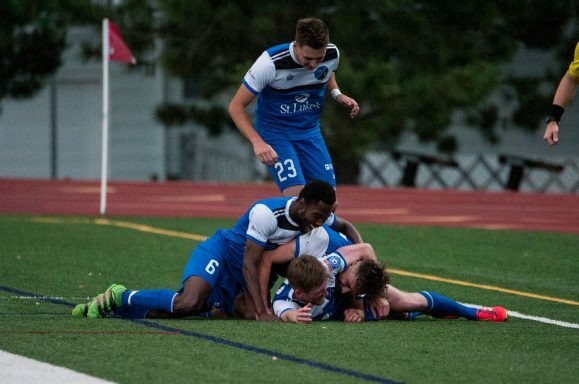 Duluth FC players celebrate after going up 2-0 against Minneapolis City SC. Image by Daniel Mick. When one thinks of sports in Duluth, soccer is not typically the first one that comes to mind. The University of Minnesota-Duluth Bulldogs claimed the NCAA Division 1 men’s hockey national championship for the second time in program history last month. The UMD women have won five hockey titles, and sent goaltender Maddie Rooney to the Olympics in February with Team USA to bring home the gold medal. Another squad from the area, Team Shuster, also won gold in men’s curling this year. If anything, the place is a winter sports haven. But the Beautiful Game has seen growth in the region over the last few years, thanks in large part to the advent of Duluth FC, the precocious club that hopes to transform the Twin Ports into a soccer hotbed one match at a time. Though Duluth FC has its work cut out as far as reshaping the city’s sports scene, it has come a long way from its humble beginnings, and winning a conference title in its debut season in the NPSL has certainly helped put the club on the map. Now, a sense of familiarity has even taken hold as the team prepares for its second season in the NPSL North. Its second season in any league, really. When the club was founded back in 2015, it was just another startup in the local Duluth amateur league, a touchstone for aging players looking to stave off the rust, and an airtight justification for a post-match pint. 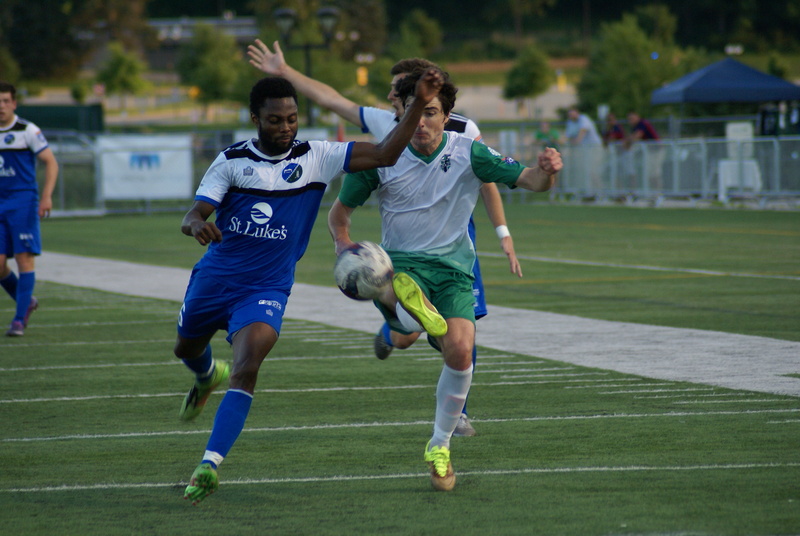 The Bluegreens upgraded and went unbeaten in the short-lived American Premier League in 2016, then took a big step forward into the newly formed North Conference in the Midwest region of the NPSL last year. So, when their title defense begins this week, the Bluegreens will, for the first time, face the same clubs they faced last season, travel the same roads, and play in the same venues (for the most part). Still, as happy as they are in their new home, plenty of change is afoot for the Kings in the North. 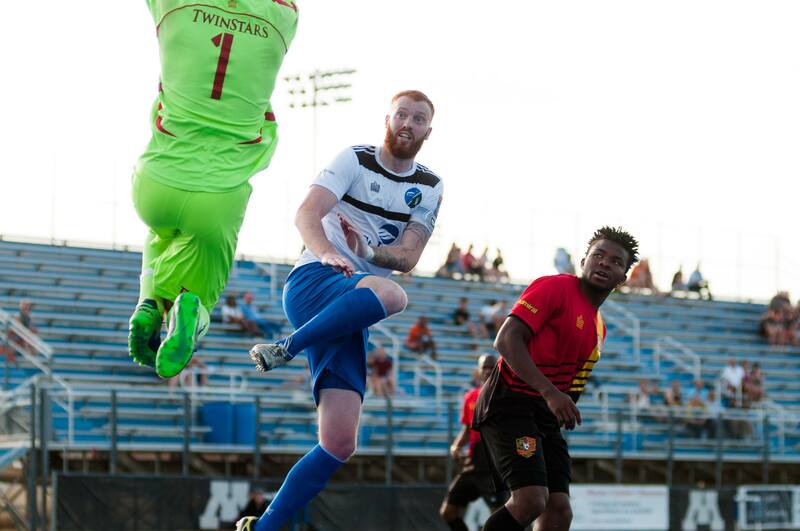 Duluth FC forward Kyle Farrer attempts to avoid TwinStars keeper Sean Teske. Image courtesy of Duluth FC. Apart from an update to the club crest, Duluth FC went through a coaching change in the offseason. Kyle Bakas left for big skies after winning the conference last year, making way for coach Joel Person to take over at the helm for the 2018 season. As an assistant for the team last season, and a former semi-pro player himself, Person brings another level of familiarity to the club even in change. Originally from Fairbanks, Alaska, Person moved south to play in college at the University of Mobile, where he was an NAIA national semifinalist three times. After stints with the Jackson Chargers, Mid-Michigan Bucks, and Chicago Eagles in the PDL in the late ’90s and early 2000s, he returned to Alabama to begin his coaching career. Early last year, Person moved on from Birmingham Hammers to take over the men’s soccer program at Northland College in Ashland, Wisconsin. He became involved with Duluth FC almost immediately. The move makes obvious sense for Person, considering his wealth of experience at the nexus of collegiate and lower division soccer. After years of playing and coaching at this level, Person has developed an understanding of how the lower division game and the collegiate game differ despite being ostensibly similar. “Typically, semi-pro franchises and the level of the player and level of competition is a little bit higher than in college,” he said. “The recruiting aspect of it is actually quite similar. The only difference is trying to get somebody to come to the place for three months instead of four years, but the actual process is pretty similar. You look at who is able to return, who wants to return, who moved on or got a job, who stayed. I’m using the contacts I have throughout my career, and the try-out process as well, to try and fill in the gaps. If replacing Bakas was not easy, neither will be replicating his success, but that is the obvious goal for the North Conference title holders. Exactly how the Bluegreens plan to accomplish that goal remains to be seen, but Person would like to see his side play with a bit more control of the ball. “Formation-wise, if it’s not broke, don’t fix it,” he said. “I don’t think I’ll mess with that too much. Formationally, we’ll probably play very similar, but stylistically, I would like to see a little bit more possession of the ball. We were very good last year as a team getting back and defending and working the counter, and it works, but at the same time I would also like to have us get accustomed to playing the ball out of the back, so that will be a good project for the summer. If he already seems like an excellent fit to lead the way for Duluth, the real kicker is that Person brings to the table the exact kind of experience the club needs as it tackles its biggest change yet. It is not just a new coach, of course, but a new competition that will define this season for the club from the Zenith City. Image courtesy of Luis Livingston-Garcia. Winning the NPSL North title may have put Duluth FC on the regional map, but that same success has also hoisted the club into the national spotlight as it makes its debut in the Lamar Hunt U.S. Open Cup, the country’s oldest national soccer tournament. When they take the field this evening, the Bluegreens will be the first amateur side from Minnesota to play in the Open Cup proper, and Person will be hoping his team can spark a run through the tournament that rivals the memorable ones he made as a player nearly two decades ago. Playing in the Open Cup means that the Bluegreens have to get ready for an even longer season and stuff even more matches into an already short window, and it will be critical for Person to maintain a roster deep enough to endure the extra work that comes with preparing for and playing in additional competitive matches. The NPSL North season is short enough as it is, which allows time for players to return to their clubs, but with extreme winter weather pushing into late April across the Upper Midwest, the impact on preseason training this spring has been even greater than in years past. Person even considered shifting from evenings to a morning training schedule. Adding an extra competition to an already compressed schedule also affects rosters, and makes it harder for a team to gel in a timely manner and develop the chemistry required to be successful on the field. In this conference, players frequently are not able to return to a club until just days before its opening match, and that is certainly the case again this season. The club even had to cancel its planned first event, a preseason friendly against Green Bay United FC, which was scheduled to be played in mid-April at Ponzio Stadium, the new venue at Northland College. Once it stopped looking like Winterfell outside, Duluth was able to schedule and play several scrimmages with local teams including the College of St. Scholastica and University of Wisconsin-Superior. Now that May has arrived in earnest, the team is as ready as it will ever be to take the pitch. The Bluegreens’ first-ever appearance in the Open Cup begins with a home tilt against a familiar opponent, NPSL North rivals and last year’s runner-up, Dakota Fusion FC, and for Person, there are clearly both positive and negative elements to this matchup. If they win their first-round match, the Bluegreens would have the option to host again a week later, and continue their run in a matchup with St. Louis FC of the USL. But the second round is the farthest thing from Person’s mind with the opener just around the corner. “We would have the option of hosting that next round against St. Louis because we won our conference and they did not, even though they are professional and we’re amateur,” he said. “Now, where this gets complicated is that there are situations where you could come to an agreement between the two teams to actually play the game somewhere else if they’re willing to split revenue or something like that. So we would actually have the rights to host that game, but there’d still be a chance that we might play it away. The U.S. Open Cup first-round match between Duluth FC and Dakota Fusion will be played at James Malosky Stadium on the UMD campus on Wednesday. Kickoff is scheduled for 7:30 p.m. The Bluegreens open the regular season with a match against TwinStars FC in Minnetonka on Saturday.